Now your antique radio can play some of the same programs it did when it was new! With your cassette tape player, phonograph or high output microphone, this one tube transmitter becomes a miniature AM broadcasting station, patterned after the 1939 Zenith model S-7000 Wireless Record Player. Assemble on a 4 x 6 ½ board. All parts and instructions included. 2 lbs. Packaging Dimensions 8.3 in. x 7.5 in. x 3.5 in. 2 answers I built this kit & it work fine except I get to loud of a hum. I double checked every thing, even replaced the tube, check filters caps & other caps. tried others radios. Any ideas?? Unfortunately we are not techs and can not offer technical advise. You may want to take this to a repairman. Most instances of hum on a high impedance input device such as this is in the case of a ground loop to the audio input. Unfortunately, most people replace the tube first. After 50-60 years sitting in boxes, if the tubes are not bad by now, they will probably outlast the builder. 1 answers Is the power supply ac or battery? Can't tell from the picture. Also, does it pick up the signal over the air from the cartridge, or is it hard-wired to the tone arm? Thanks. The power for this kit is A/C supplied. The signal is transmitted over air. The schematic and instructions are posted to preview. 1 answers Is this available with a 240V transformer? This kit is only available with a standard 110v transformer. Per page five of the instructions manual posted above, you should target 1,100 and 1,600 KHz. 1 answers how do you connect an iPod? I don't seem to see a 3.5mm aux input. 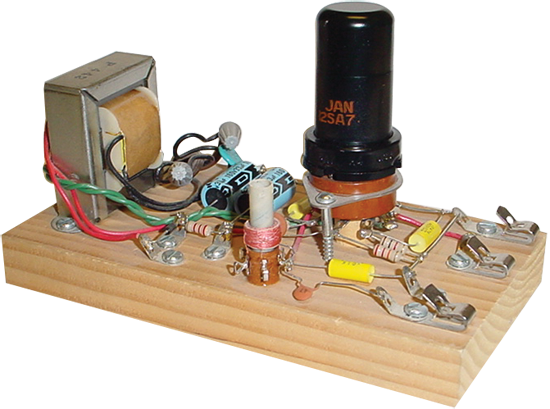 This kit is designed for an antique radio and would need to be modified to accept a 3.5mm input. Any modifications would be at the builders discretion and should be researched thoroughly referencing the schematic and layout as this is not something we have attempted in house. 1 answers Mine worked good for years, thanks but I need a new power transformer. Is it possible to purchase one? Hi, you can find the transformer for this kit by searching for P-T442. 1 answers Is there a way to add crystal to circuit to prevent drift? Any modifications would be at the builders discretion and should be researched thoroughly referencing the schematic and layout as this is not something we have attempted in house. 1 answers Does this actually comes with the tube and inductor? Yes all parts are included to successfully assemble this kit. 1 answers Your description says it works with a cassette tape player. Will it transmit from a CD player as well? The instructions state that you can use the earphone output jack of a cassette player as an audio source. The same principle should work with a CD player. Modification may be required and any modification would be at the builder's discretion. 1 answers so anybody have any experience with adding a pre amp to this using another 12 volt tube like a 12ax7 or anything else? We do not have any experience in modifying this transmitter. This kit is not designed for long range use. It's design is to transmit wirelessly room to room in close proximity. 1 answers Would this transmitter accept input from a bluetooth receiver? We have no way to verify that is can accept input from a bluetooth receiver. This accepts one mono audio input. This was a quick and easy kit to make. Spent a few nice hours making it tonight. The audio is really nice on my Zenith Long Distance. Enjoying Rat Patrol Radio from live365 as I type! And Space Patrol sounded amazing, too! Worth the money, no doubt.